This year's program was exciting, exhausting, and just all out fun. Each year we challenge students to get out of their comfort zone by meeting new students, learning to work as a team, and solve global problems. These are the same requests business owners today ask of their newly hired employees. The Code-A-Thon program provides students an opportunity to explore real-world problems and gain an understanding of what life is like to work in a diverse team that must first learn together and then demonstrate their new-found skills as a team to solve a problem that they have determined will have global impact to society. For many students participating in the program, coding is an entirely new and very foreign concept, one that they are confused about and in many cases, may have misconceptions of what life is like to code. After 48 hours what was once foreign is now better understood and it is clear that coding is challenging, yet provides an amazing opportunity to solve real-world problems. For those first year students they still have a lot to learn, but they now know how to continue learning, what resources are available to them, and they value their team mates talents and skills that supported not only their success but the success of the entire team. Problem solving, critical thinking, and synthesizing information. Running a 48 hour Code-A-Thon is a challenge but it is so worth it. This year two young engineers from Sandusky County OH decided to take on the challenge to disrupt the norm and show their community that by coming together they can provide their students an immersive learning experience. "The Code-a-thon is a wonderful experience for both students and volunteers. Yes, the students learned about a semester's worth of knowledge on how to program computers all within a 48 hour period, but they were also able to go out of their comfort zone and learn many other skills that are essential to today's work environment." said Doug Steinberger co-site lead for Sandusky County Code-A-Thon. "The Sandusky County, Ohio Code-a-Thon was hands-down a first-year success. Myself (a civil engineer) and the other site lead, Doug Steinberger (a biomedical engineer), share a passion of giving back to our hometown through STEAM promotion for youth. The Code a Thon event was a perfect fit for our mission. I was so impressed by the teens who showed up and shared their excitement and thirst for technical knowledge. When we first advertised the Code a Thon event to Sandusky County, it seemed so unlikely that we would get enough students interested, especially girls. In the end, we had 75% girls participation locally. Our sponsors were equally excited to meet with the teens and explain their need for local technical workers. Our local college even offered an extra incentive beyond the corporate prizes. The teens’ final projects blew me away—I had witnessed the time and effort it took for each participant, and during their presentations I got a bit emotional. The teens gained so much practical knowledge and experience in one short weekend." said Elizabeth Royster co-site lead for Sandusky County Code-A-Thon. In order to support new host locations, we developed a scaling model to build capacity and offer our Community Ambassador Program (CAP) a leadership model for students to work towards. Learning to teach is transformative. Anyone who has experienced having to learn content deeply so that you can help others understand through teaching knows this sense of reward well. This year we were able to provide the leadership opportunity to Vincent Occhiogrosso a Senior CAP student. Vincent, who is now a freshman at Farmingdale University has been teaching and supporting our programs since his junior year in high school. This year Vincent supported Sandusky County and the team of volunteers to run their first Code-A-Thon. Other CAP students like Raffi Sanna, a Junior at Cold Spring Harbor High School, was preparing for that same opportunity by teaching in our programs locally here in Long Island and in New York City. Raffi not only taught the first-year students in Westbury, but he helped shape the content that was utilized across all the Code-A-Thon sites this year. Our CAP students are students looking for the opportunity to be challenged and to challenge themselves through these leadership experiences. As our Community Ambassador Program grows in locations like PA, DC, OH and in NY Metro, our ability to support more communities becomes possible. In their third year working with WCTD the Darby, PA Community now has its own Community Ambassador Program, thanks in part to the support of the Pennwood Foundation. 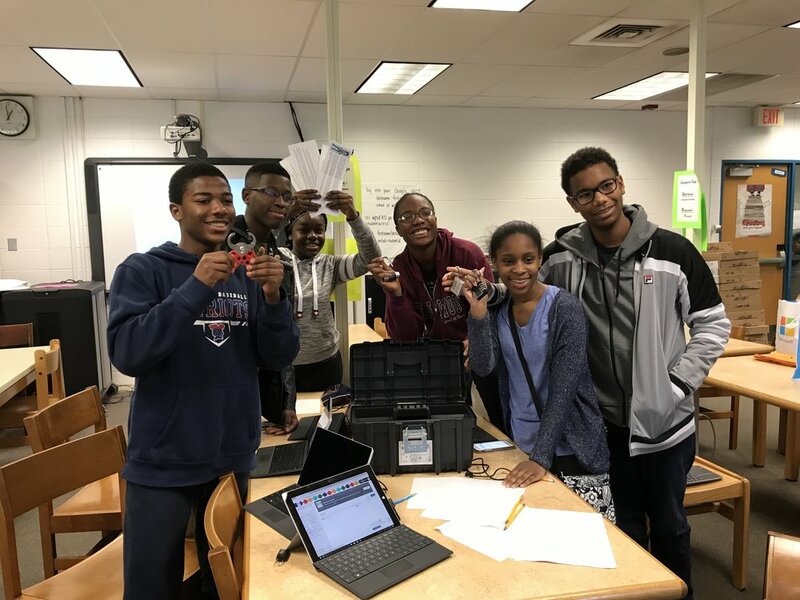 We visited Darby this past December to train the CAP students on our Unlock the Box activity so that they could lead the activity during the Code-A-Thon this year. Not only does the CAP create leadership opportunities, it supports communities to bring programs that would otherwise not be available, disrupting the digital divide across communities. The Code-A-Thon is a community program. Our volunteers come from the local businesses looking to build a pipeline of future employees, local government supporting economic impact through workforce development, educators from surrounding schools seeking to learn and bring the knowledge back to their classrooms, parents who have seen the transformation in their child giving back to support our success, industry experts volunteering their entire weekend to teach and share their career experiences with students. Thank you to all our volunteers especially to Allison Bloom a volunteer who has been with us from the very beginning, who leads our Volunteer Management and is the first person volunteers hear from. Without the support of our volunteers we would not be able to provide this program to students at no cost. Thanks to the generosity of Insight, our main sponsor of the Code-A-Thon this year, we were able to provide T-Shirts to the students and volunteers. In seeking a company to work with to produce the T-Shirts we partnered with Spectrum Designs for the Code-A-Thon. Spectrum provides gainful employment and meaningful work opportunities to individuals with autism within a social enterprise; in an effort to assist them in leading fuller, independent and productive lives. Spectrum is the ideal place for teenagers and young adults with autism to address possible employment barriers for the future. Many students who participate in our programs are on the Autism spectrum, and we know first-hand how transforming learning to code can be for an Autistic student. We look forward to continuing to work with the Spectrum Design team. Thank you to John Wargo from Microsoft, Kerri Shotts from Adobe, Don Coleman from Chariot Solutions, and Chris Gomez from Medicity for giving so much time over the past year planning for the Code-A-Thon and shaping this year's curriculum for both our first years’ and our advanced web development for our alumni students. Our industry advisors are critical to our success and our ability to ensure what we are teaching can transcend into value for our students long term. Our goal is to spark an interest, and shape strong foundational skills that students can build upon to continue to learn either on their own, or through continued education in high school, college, and beyond. Thank you to our sponsors who supported feeding our students, providing t-shirts for the students and volunteers, prizes for the winning teams and transportation and supplies to support our host sites. This program would not be possible without your investment and trust in our organization. Our partnerships with industry, government and education are key to how we work together to transform education and ensure that every student has the opportunity to experience programs like the Code-A-Thon. We would like to thank the government organizations that game together to work with us this year, who supported the kick off and final presentations, as well as delivered presentations. Thank you to Lieutenant Governor Kathy Hochul, Nassau County Comptroller Jack Schnirman, and Legislator Siela A. Bynoe for your support of our mission. Thank you to Princess Young from the Department of Homeland Security for sharing with the students valuable information regarding free education and career opportunities in Cybersecurity. A big shout out to this year's judges who came out on a Sunday afternoon to be a part of the program, volunteering their time to provide valuable feedback to the teams. Their role is the hardest role in the program, to make the difficult decision on the top three teams. Every student who participated came away with incredible value in the learning experience and investing in themselves for their future. Finally, a big thank you to my team, Maria Catenacci, Michael Teal, Allison Bloom, Maureen Sanchez, Jenny Adames, Cathy Monacella, Brigitte Apostolakos, Vincent Ochiogrosso, Raffi Sanna, Nicholas Paladino, Joseph Cassidy, Nate Eisenberg, Conor McCormack, and Thomas Carey. Check out the Code-A-Thon Video Highlights, we hope you enjoy watching.